Your EHDI program website’s primary purpose is to support your program’s mission and provide access to information about the EHDI process. Collaborating with your web development team, stakeholders, and knowing your states policies and practices before implementing or modifying an EHDI website is vital to its success. An effective website necessitates a marketing plan to ensure that it is reaching its target audience. As viewer expectations and information changes, your site needs to change to meet these needs. This section provides recommendations on marketing and managing an effective, functioning website over time. Marketing your state’s EHDI website is an effective way of telling people about your program and how your services can meet their needs. By having quality content and an established identity for your organization, people will remember and use your State’s EHDI website as a reliable source of information. Many marketing strategies work together increasing the effectiveness of online and off line promotion of your state’s EHDI program and website. Direct promoting of an EHDI website is a collaborative effort of EDHI administrators, staff, and stakeholders. Traditional methods include talking to people and passing out print material about your website. Technology has allowed organizations to expand their marketing techniques to communicate with larger audiences in a cost effective manner, using social networking sites and electronic media. The visibility of your state’s EHDI website is determined by how easily it’s found in a search and by its web address (URL). If your site is hosted within your state health department’s website consider applying some of their branding for your brand. An example is California’s EHDI program’s logo (fig 4.1a) uses a similar heart shape and the same blue color as the Department of Health Care Services logo (fig 4.1b) in California. Other EHDI programs that are hosted separate from the state, like Pennsylvania, have created their own visual style for their website that crosses over into their documents. Collaborate with stakeholders and people involved within your program to come up with guidelines that benefit your organization. The Red Cross has a well-known non-profit brand identity. When people hear or see the Red Cross logo, they think of the organization and what it stands for—an emergency response organization that aims to prevent and relieve suffering in a variety of situations. Over the years people have come to trust them. The following examples of brand identity guidelines are provided to give EHDI administrators ideas on creating their own guidelines. Stakeholders are the most efficient (positive or negative) promoters for an organization. Word-of-mouth promoting is virtually free, spreads quickly, and can make a major impact on people’s decisions about whether or not to use your organization’s resources. Personal: most effective method, personal communication occurs between individuals or via a presenter to a group of people. During face-to-face conversations the audience is influenced by words, voice tone, and body language. During telephone conversations, audiences can pick up tonal cues from the sender. Digital: successful at traveling quickly over long distances and can involve conversations or one-way electronic communications. Multimedia-based communication influence people via images, audio, and text based dialogue. Examples include websites, blogs, Facebook, email, and YouTube. Text-only messages include Twitter, text only emails, RSS feeds, and instant messaging. Viral: success comes from massive exposure. Impressive video footage or something ‘chat worthy’ that gets passed through the population via personal email or a similar tool. n.p., “Word of mouth, social media and viral advertising,” Marketing-Made-Simple.com, n.d. Web. 10 Nov 2011. After the PA EHDI website was made live, key stakeholder representatives who participated in development of the website helped to spread the word. For example the PA Advisory Committee Chair, who is also a past President of the PA Academy of Audiology, presented on the state EHDI program at a state-wide meeting of the PA Academy of Audiology. 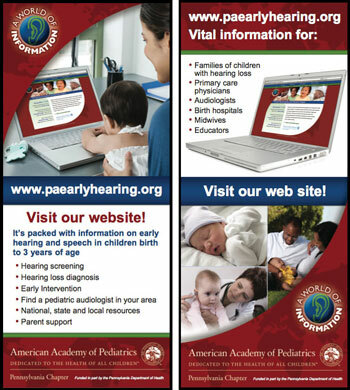 His presentation featured the website and included comments on how it could be a valuable resource for PA audiologists. Also, early intervention stakeholders who attend PA Advisory Committee meetings and who contributed to the website design also conduct yearly state-wide meetings of early intervention providers. These individuals now start the meetings with a brief update on the state EHDI program and always mention the EI information available on the PA EHDI website. Example provided by Arthur A. Florio PA EHDI administrator. A signature line or tag line is a message or content added to the end of all outgoing messages. This can be setup automatically through your email account settings. Promotional materials let people know about your website and organization. Promoting can be done through print materials or electronically in both a direct and non-direct way. Create promotional pieces by adding the web address of your State’s EHDI website to materials you already have. Items sent to stakeholders and policy makers include letterheads, business cards, stationery, brochures, postcards, pamphlets, and literature. Adding a “tag line” with the EHDI web address to your email signature costs nothing and can be sent out hundreds of times a day. Use the brand identity concept to create stronger products to promote your State’s EHDI website and program. These products can be mailed, sent electronically, distributed at conferences, or downloaded from your site. Newsletters are the most common item used to keep stakeholders and the public informed about the happenings within an organization. A Rack Card is an advertising tool. They are typically 4 by 9 inches in size and are designed to get people’s attention. They can be included as an insert with mailings. *These sites are not endorsed by NCHAM, and are provided only as examples. Social networking is a form of communication that builds awareness of a state’s EHDI program through dynamic web technologies. The key to success in online marketing through social networks is having consistent, meaningful posts, and interacting with the participants. Relationships are developed between audiences and your organization through the sharing of knowledge. Take time to review your state EHDI program’s marketing strategies to determine the best approach for social networking. Research what types of tools and social communities people use to find information related to your program’s goals. Social networking sites encompass the principles of blogging, forums, and sharing of social media. Participants can create profile pages and promote themselves and their organization through links and by building a fan base. Some organizations provide these tools within their own sites. Whether you go to social networking sites or have social tools on your site, a State EHDI program can connect with other individuals or groups that have similar interests or share ideas and experiences. Another way for audiences to know what is going on in your program is by providing an RSS feed on your website people can subscribe to. RSS feeds are a simple way for state EHDI programs to send out website content updates, news articles or other information that is important to audiences. No promoting is necessary other than having a link available that people can use to sign up to receive these updates. A crucial step to marketing is making sure people are able to locate your state’s EHDI website. Providing direct links to stakeholders ensures that they can type in or click the URL to find the home page of your site. Otherwise, audiences must rely on search engines, such as Google or Bing (database driven companies that store information about other website that users can use to search the World Wide Web) to find your website. Search engines use complex algorithms to determine a site’s ranking based off of key words used for the search that are relevant to their site. The intent of this section is to provide information about variables used in search engine algorithms. Work with web developers to determine the most effective and ethical strategies for search engine or web site optimization. Exploiting loopholes - “gaming the system” – can cause your ranking to be significantly demoted or your website banned from Google searches. Best ranking practices entails writing quality content for your targeted audiences on your website and for social networking. Submitting XML site maps to common search engines. Use “partner” sites to distribute your EHDI website link because of their potential value in directing appropriate users to your site. Managing your state EHDI program’s presence on the Internet involves collaborating with key stakeholders, partners, and your web development team to ensure the website and its content are of high quality. Working together, you can create a site that meets the needs of families, healthcare providers, interventionists, and the public to achieve the program’s mission. Ensure that your website is achieving its purpose by using a continuous process of monitoring and revisions when needed. Resources and tools are available everywhere for quality improvement processes. This section provides a strategy that EHDI administrators can use as a guide for their website improvement efforts. 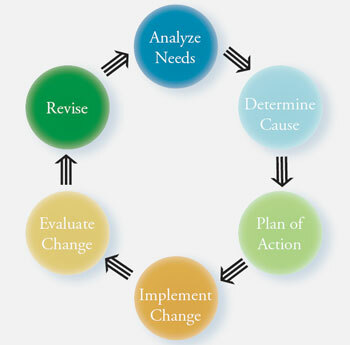 Start by analyzing your state EHDI program’s website to find a need for change or improvement. This is found by comparing the desired outcomes or what your program wants to achieve with its website and what your state’s EHDI website currently accomplishes. The gap where the current state of the website doesn’t meet its desired goals is the element that should be improved. The EHDI Website Resource Guide provides a list of key components in the areas of content, design & layout, and accessibility as a guide for EHDI administrators in this process. Collaboration with key stakeholders, EHDI staff, and using tools such as website surveys can assist in identifying gaps as well. It is important to determine the cause of the gap before making a plan of action. Otherwise the selected improvement method may not be the best solution to attain the desired results. Be aware of state or your webhost’s guidelines and policies before implementing your plan of action. When your program is ready, implement changes to your website. After some time, evaluate the changes made to verify that the desired outcomes are being met. If the website is not meeting its expectations for the change, revise the plan of action or repeat the CQI process by analyzing new data. Additionally, it is important to collect more in-depth information, be it through a web-based online tool such as an analytics program or by interviewing selected users every two-three years, to quantify the achievements of your state’s EHDI website. Wikipedia provides a list of web analytics software that is available. A Website is a dynamic tool used to provide information and resources. It is not meant to be static. State EHDI websites are a valuable resource for all stakeholders in your organization. Routine maintenance of the website is essential to improve quality, verify that content is up-to-date, and provide the newest information to stakeholders. Improvements can be as simple as changing contact information to fixing a link or as complex as reorganizing the site’s structure to implement accessibility standards. There is no set time on when a website should be updated or redesigned, but continuous monitoring and implementing needed changes helps to extend its life. Analyzing the state’s EHDI website once a year will help in determining if the state’s EHDI program is meeting the needs of its stakeholders and the program’s mission. Smaller updates or changes should be implemented as needed. EHDI administrators should take into account who will be implementing the change, approvals needed (if any), time constraints, and if the improvement will benefit stakeholders and the state’s EHDI program. The goal of maintaining a website is to keep audiences interested in what your program has to offer. Providing quality content that is accessible, up-to-date, and having new information about early hearing detection and intervention services in your state will keep stakeholders coming back to your site. The PA EHDI website provides two mechanisms to obtain feedback on the quality of their website. First, they’ve created an easy way to ask questions about the state EHDI program or to report issues, broken links, offer comments. At the top of every page is a “Contact Us” selection that takes users to a page that has all of the PA EHDI contact information and a form that users can fill out. Give the user an opportunity to offer suggestions for what other features or information they would like added to the site.